the fash pack: congratulations, mich! everyone on facebook was congratulating mich today for this brilliant brilliant achievement! so listen, kids, if you work hard, learn and study your craft well, are passionate about what you do, make an effort to meet the right people and network, you can achieve anything you want—even international recognition! Young Filipina fashion designer Mich Dulce is this year’s winner of the International Young Creative Entrepreneur (IYCE) award for Fashion at the London Fashion Week. Mich also known as a Pinoy Big Brother participant, the ABS-CBN reality show a few years back, faced stiff competition from amongst young forerunners in the fashion industry but her unique creativity and international outlook gave her an edge over the other shortlisted candidates. 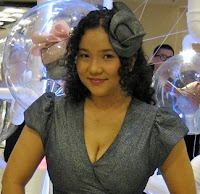 Since studying the art of hat making in 2005, she has unleashed a flurry of delightful headpieces onto Manila’s runways, as well as for theatre and various individuals, eccentric or not. Each of her hats are handmade, exquisitely moulded and always with a whimsical touch that makes it distinctly her own, whether it’s her geometric experimentation, her unusually sculpted fabric, or her unconventional use of materials. In 2009, Mich expanded her skill set by studying the art of Period Corsetry to complement her entry into the bridal market in the same year. As the official Philippine entry, Mich was sent on a 10 day all expenses paid trip to the UK where she met industry professionals and toured leading organisations in the fashion industry. The UK trip culminated with her attending London Fashion Week, together with fellow contestants from Bangladesh, India, Libya, Lithuania, Russia, Sri Lanka, Syria and Turkey. It was there that she was announced the winner. Mich will receive grant money of GBP 5000.00 to be used on a collaborative project with the British Council.